This print is from the series Spring is Everywhere (Yomo no haru - 四方の巴流). In 1795 Tsutaya published a less-than-successful volume under this same title "to commemorate the appointment of the leading kyōka-master Yomo Utagaki Magao to the position of senior judge of kyōka. Of the 7 artists commissioned to make contributions to this book only two were well known: Rinshō and Masayoshi. Other edited versions came out with a shifting group of images and artists. Another album (the only copy I have traced is in the Museum of Fine Arts, Boston) is in two volumes with three prints in each." Later "The third of these variants contains three prints only: the Eishi, the Masayoshi 'Frozen lake' and the Hokusai 'Ferry-boat'." Source and quotes from: The Art of the Japanese Book by Jack Hillier, vol. 1, p. 442. 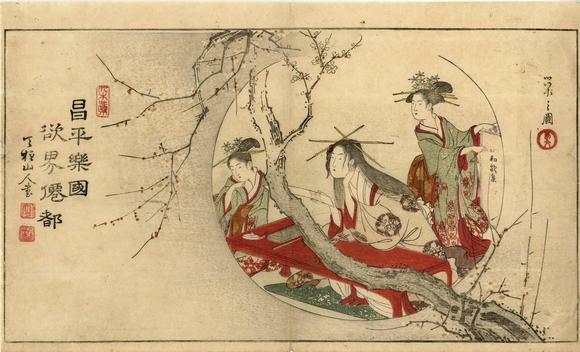 This includes a half-page, black and white reproduction of the same Eishi print in the Lyon Collection. The Museum of Fine Arts in Boston refers to this as a Chinese couplet by Tenchū Sanjin. There is a small black and white illustration of this print in The Art of Surimono: Privately Published Japanese Woodblock Prints and Books in the Chester Beatty Library, Dublin by Roger Keyes, vol. I, #385, p. 442. The first four characters read: 昌平樂圖. 昌平 (shōhei) translates as 'peace' or 'tranquility'. 樂 can mean 'comfort'. 圖 (zu), of course, is 'picture'.